Fittings Terrace, British Columbia | About Us | Rudon Hydraulics Ltd.
Rudon was started in 1981 when the founders, Russ Smith and Don Collison, traded a pig for an International TD14 crawler tractor. Vulcan Machinery later enlisted the company to provide the service work on the International/Dresser product line that they were promoting. After Vulcan closed a few years later, Rudon Enterprises Ltd. started buying machines at auction and reselling or parting them out. Around the same time, the hydraulic hose and fitting business started to grow exponentially and Dan Lindstrom was hired to run that side of the business. 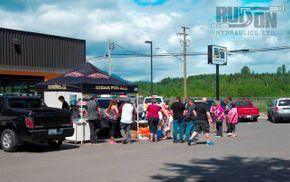 Fast forward a few years and the hydraulic hose and fittings began to eclipse the shop and parts sales to become the thrust of Rudon Enterprises Ltd. In 2001, Russ Smith succumbed to a lengthy battle with cancer and Don Collison took on the responsibility of guiding the company through the struggling local economy. After five years, we moved to a smaller location – it was during that time that Dan Lindstrom and Collison’s son, Robert Collison, became business partners. Rudon Hydraulics remains the largest supplier of hydraulic hoses, fittings and adapters in northwest British Columbia.